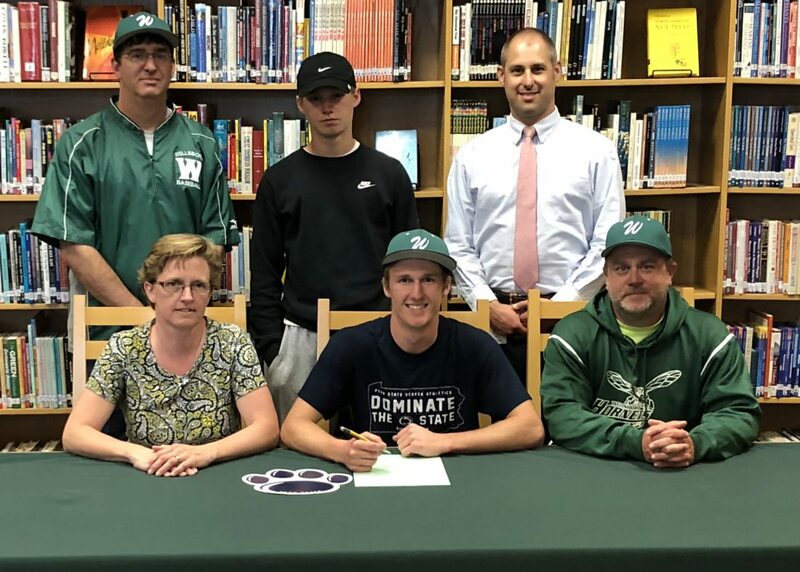 PHOTO PROVIDED Wellsboro senior Johnny Rowland will continue his baseball career at Penn State-Beaver. Seated next to Rowland are his parents, Angela and Aric. Standing in the back are, from left, Wellsboro baseball coach Philip Prough, Rowland’s brother Zack and Wellsboro athletic director Matt Rendos. Rowland has hit .308 for his career at Wellsboro and in his 18-5 in his career as a pitcher. Anne Weller recorded her 300th career strikeout in a 12-2, five inning loss to CMVT in softball on Friday afternoon. Weller also went 2 for 2 at the plate and scored two runs. CMVT scored 10 runs between the third and fourth innings to break the game open. Sullivan County didn’t waste much time, jumping out to a five-run lead after the first inning en route to a 16-0 rout of Canton in softball in four innings. Jessica King, Mykenzie Malacusky and Jaeden Patson all led Sullivan County with two hits each. Wellsboro’s Kerrah Clymer was 3 for 4 with a triple and two runs scored and Kailee Clymer hit a two-run home run as the Green Hornets easily beat Towanda, 12-3. Ryann Adams was 2 for 4 with a double and Hailey Neal went 2 for 3 with a double. Lexi Schuler went 3 for 3 with a double and in the circle held Montoursville to just four hits as Jersey Shore defeated the Warriors, 6-0. Brianna Johnson led Montoursville with a 3 for 3 day as she added a double. Lewisburg and Bloomsburg’s offenses went back and forth as Lewisburg came out with a 17-16 victory. Lewisburg’s Lily McBride hit a grand slam in the first inning. North Penn Liberty fell to Troy on a walk off single in the bottom of the seventh inning, 2-1. Savanah Doney struck out 10. • Taynton Repard went 3 for 4 with a triple and Silas Wagaman was 3 for 3 as Wellsboro defeated Towanda, 13-8, in baseball. Parker Mann, Carson Davis, Johnny Rowland and Dalton Prough all had two hits each. Jacob Corson, Brock Stroup and Carter Marquardt all had two hits each and Marquardt had two RBIs, but Hughesville lost to Danville, 8-4. Dakotah Snyder was 3 for 4 with a triple, RBI and run scored, but Lewisburg lost a close one to Central Columbia, 3-2. St. John Neumann continues to compete with the conference leaders but came up just short in the final regular season matchup with Millville, 4-3. Naaman Amos hit a towering two-run home run to tie the game in the fourth inning. St. John Neumann has to win three of its remaining six games to qualify for playoffs for just the third time in school history. • Loyalsock beat Hughesville in boys track and field, 85-61. Loyalsock’s COle Cavanaugh won the discus by 13 feet with a throw of 99 feet, 7 inches. Devon Bushor earned wins in the long jump (20-0), triple jump (39-9) and high jump (5-6). • In girls track and field, Loyalsock beat Hughesville, 78-72. Isabel Sagar won the 1,600 by 25 seconds and cruised to a win in the 3,200, winning the event by nearly three minutes. Hughesville’s Jayden Leighow earned wins in the triple jump and high jump. • Colton Riley had a double, Penn College’s only extra-base hit, and the Wildcats scored two late seventh inning runs to defeat Penn State Abington, 3-2, in the North Eastern Athletic Conference playoffs. Anne Weller, Breanna Minnier (5) and Cheyenne Danneker. Bridget Fausey and Michelle Hackenberg. W–Fausey. L–Weller. Top St. John Neumann hitters: Anne Weller 2-2, run; Cheyenne Danneker 1-3, run; Breanna Minnier 1-3, RBI; Maria Helminiak 1-3; Julianna Kriner 1-2; Ellie Androvette 1-3. Top CMVT hitters: B. Fausey 2-4, 2B, RBI; G. Six 2-3, 2B, RBI; K. Bloom 2-3, 3B, 3 RBIs; E. Sutherland 2-3. Records: St. John Neumann (4-11). Next game: St. John Neumann at Montgomery, Tuesday. Top Sullivan County hitters: Jessica King, 2 hits; Mykenzie Malacusky, 2 hits, 4 RBIs; Jaeden Patson, 2 hits, RBI; Madison Burke, 2 RBIs. Dunn and McLinko. Cathryn Brought and Sydney Tremper. W–Brought. L–Dunn. Top Towanda hitters: Vargason, 2B, 2 RBIs; McLinko 2-3. Top Wellsboro hitters: Ryann Adams 2-4, 2B, 2 runs; Sydney Tremper, 3B, 3 runs; Kerrah Clymer 3-4, 3B, RBI, 2 runs; Kailee Clymer, HR, 2 RBIs, run; Hailey Neal 2-3, 2B, 2 runs. Mackenzie Weaver and Jordan McCarthy. Lexi Schuler and Alyssa Stover. W–Schuler. L–Weaver. Top Montoursville hitters: Brianna Johnson 3-3, 2B. Top Jersey Shore hitters: Lexi Schuler 3-3, 2B; Alyssa STover 1-3, RBI; Gabby Vuocolo 2-3, 2 RBIs. Records: Jersey Shore (13-2). Next game: Towanda at Jersey Shore, Monday. K. Loff, L. Gorder and E. Hall, L. Gorder. Sydney Huffman and Katie Koch. W–Hoffman. L–Gorder. Top Bloomsburg hitters: R. Klinger 2-6; K Loff 4-5, 2 runs; L. Kreisher 3-6, 2 runs. Ruftucher 2-4, 2 2B; Temple, 2B; Gorder 2-4 2B, 2 runs; E. Hall 3-5, 2 runs. Top Lewisburg hitters: Delaney Wagner 2-4, 2 runs; Katie Koch 3-5, 2 2B, 3 runs; Sydney Hoffman 2-5, 2B. Kendall Murphy 2-3, 2B; Lily McBride, grand slam. Records: Bloomsburg (7-10), Lewisburg (12-3). Next game: Lewisburg at Central Columbia, today, 11 a.m.
Savanah Doney and Mariah Kshir. Watson and Cory. Top North Penn-Liberty hitters: Abby Heatley 2-4; Emma Williams 1-3; Mariah Kshir 1-3; Dalaney Colton 1-3. Top Troy hitters: Watson 1-3, RBI; McClean 1-3, 2B; Hoffman 1-3; Cory 1-3, walk-off RBI. Records: NP-Liberty (10-4). Next game: NP-Liberty at NEB, Monday, 2:30 p.m.
Dunn, Manchester (1), Tama (3) and Bartholomew. Dalton Prough, Carson Davis (3) and Caleb Tennis. W–Davis. L–Tama. Top Towanda hitters: Kunkle 2-4, 2B, 3B, RBI; Dunn 2-4, RBI; Rogers 1-3, 3B. Top Wellsboro hitters: Taynton Repard 3-4, 3B, RBI; Silas Wagaman 3-3, RBI; Parker Mann, 2 hits; Carson Davis, 2 hits; Johnny Rowland, 2 hits; Dalton Prough, 2 hits, 2B, 2 RBIs. Records: Wellsboro (14-2). Next game: Wellsboro at Danville, Monday. Brycen Heimbach, Shane Kozick, Brandon McGaw and Zach Zerbe. Hill, Jacob Corson, Brock Stroup and Jared Snyder. Top Danville hitters: Austin Heeter 3-4, 2 RBIs; Brandon McGaw 3-4, 4 RBIs; Alex Robenolt 3-4; Shane Kozick 3-4. Top Hughesville hitters: Jacob Corson 2-4; Brock Stroup 2-3, RBI; Carter Marquardt 2-3, 2 RBIs; Chance Webb, 1-3. Records: Hughesville (4-12). Next game: Hughesville at Loyalsock, Monday. Top Lewisburg hitters: Dakotah Snyder 3-4, 3B, RBI, run; Andrew Ramirez 2-4; Nicholas Shedleski 1-3; Peter Marrara 1-3; Owen Arndt 1-2. Brandon Loner, Jaiden Cioffi and Adam Helminiak. Savage, Holdren, Robbins and Logenberger. Top St. John Neumann hitters: Naaman Amos 1-3, HR, 2 RBIs; Brandon Loner 2-4; Jaiden Cioffi 2-4, 2B. Top Millville hitters: Berton 2-4, HR; Robbins 1-4, 2B; Savage 2-3. Records: St. John Neumann (7-7). Next game: Sullivan County at St. John Neumann, Tuesday, 4:30 p.m.
3,200 relay: 1. Loyalsock (Jacob Daniels, Alex Reed, Dominic Jennings, Brandon Shearer), 9:20.60; 2. Hughesville (Beau Draper, Brandon Moore, Justus Leighow, Justin Whitmoyer), 10:37.10. 110 hurdles: 1. Nicholas Houseknecht, H, 18.20; 2. Simeon Krizan, L, 18.50; 3. Curtis Trowbridge, L, 18.90. 100: 1. Zach Stopper, L, 11.30; 2. Zach Alberti, L, 11.50; 3. Austin Lewis, H, 11.60. 1,600: 1. Quinn Serfass, L, 4:43.20; 2. Alejandro Quintana, L, 4:43.90; 3. Ryan Bahr, H, 4:49.10. 400: 1. Austin Long, H, 52.40; 2. Brady Dowell, L, 55.00; 3. Jacob Huber, L, 55.20. 400 relay: 1. Hughesville (Devon Bushor, Dalton Clarkson, Donte Bair, Austin Lewis), 46.10; 2. Loyalsock (Jacob Huber, Tyler Hertwig, Alex Heiser, Darius Williams), 46.20. 300 hurdles: 1. Peyton Salvatori, L, 44.30; 2. Hadyn Watkins, L, 44.50; 3. Simeon Krizan, L, 45.00. 800: 1. Matt Nickolaus, L, 2:05.10; 2. Dominic Jennings, L, 2:12.10; 3. Alex Reed, L, 2:17.20. 200: 1. Austin Lewis, H, 23.70; 2. 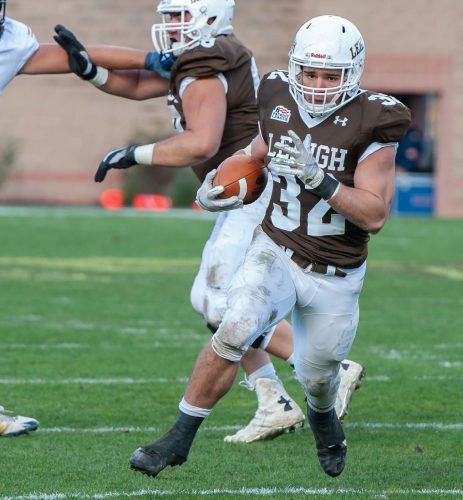 Zach Alberti, L, 23.80; 3. Kolton Smith, M, 24.20. 3,200: 1. Ryan Sullivan, L, 10:00.30; 2. Alex Reed, L, 11:24.20; 3. Ryan Strimple, H, 12:02.30. 1,600 relay: 1. Hughesville (Nicholas Houseknecht, Austin Lewis, Beau Draper, Austin Long), 3:43.80; 2. Loyalsock (Brady Dowell, Benjamin Robbins, Peyton Salvatori, Jacob Huber), 3:47.10. Shot put: 1. Luke Kepner, H, 45-3; 2. Zane Gee, H, 38-11 1.2; 3. Hunter Knott, L, 37-7 1/2. Discus: 1. Cole Cavanaugh, L, 99-7; 2. Nathan Fagnano, L, 86-0 1/2; 3. Trent Stetts, H, 85-4 1/2. Javelin: 1. Jacob Waltz, L, 132-8; 2. Chad Bomboy, H, 130-9; 3. Alex Heiser, L, 121-2 1/2. Long jump: 1. Devon Bushor, H, 20-0; 2. Jacob Waltz, L, 19-10; 3. Kolton Smith, M, 19-6. Triple jump: 1. Devon Bushor, H, 39-9; 2. Logan Franquet, L, 34-7; 3. Benjamin Robbins, L, 34-3. High jump: 1. Devon Bushor, H, 5-6; 2. Logan Franquet, L, 5-4; 3. Brady Dowell, L, 5-4. Pole vault: 1. Caleb Dixon, H, 9-0. 3,200 relay: 1. Loyalsock (Anna Burdett, Jaime Ellis, Mackenzie Rodarmel, Elisa DiNicola), 10:45.60; 2. Hughesville (Rachel Detweiler, Molly Forwood, Lauren Henry, Gillian Way), 12:07.90. 100 hurdles: 1. Megan Kendall, L, 16.80; 2. Allie Dowell, L, 17.00; 3. Olivia Bower, H, 17.40. 100: 1. Alexa Rine, M, 12.80; 2. Charlotte Neylon, L, 12.90; 3. Hailey Zurich, L, 13.00. 1,600: 1. Isabel Sagar, L, 5:21.60; 2. Cierra Getz, H, 5:46.30; 3. Avery Rouhouff, H, 6:03.50. 400: 1. Averi Rine, M, 1:00.60; 2. Ashlynne Eichenlaub, H, 1:02.90; 3. Morgan Hopkins, H, 1:03.20. 400 relay: 1. Loyalsock (Erin Machmer, Sophia Gardner, Hailey Zurich, Charlotte Neylon), 50.40; 2. Millville (Mackenzie Sweeney, Alexa Rine, Olivia Belles, Averi Rine), 51.40; 3. Hughesville (Olivia Bower, Georgia Fields, Kenna Ammar-Khodja, Jayden Leighow), 51.50. 300 hurdles: 1. Allie Dowell, L, 49.80; 2. Megan Kendall, L, 50.20; 3. Olivia Bower, H, 50.50. 800: 1. Mackenzie Rodarmel, L, 2:29.00; 2. Cierra Getz, H, 2:32.00; 3. Anna Burdett, L, 2:34.00. 200: 1. Charlotte Neylon, L, 26.80; 2. Alexa Rine, M, 27.00; 3. Erin Machmer, L, 27.40. 3,200: 1. Isabel Sagar, L, 10:55.70; 2. Cierra Getz, H, 13:58.60; 3. Avery Rouhoff, H, 17:01.10. 1,600 relay: 1. Hughesville (Olivia Bower, Morgan Hopkins, Cierra Getz, Ashlynne Eichenlaub), 4:21.20; 2. Loyalsock (Elisa DiNicola, Megan Kendall, Erin Machmer, Anna Burdett), 4:22.40. Shot put: 1. Alisha McKinley, H, 31-5; 2. Emilie Detweiler, H, 28-9; 3. Karlee Wallis, H, 25-1 1/2. Discus: 1. Emilie Detweiler, H, 83-9 1/2; 2. Alisha McKinley, H, 81-9; 3. Karlee Wallis, H, 79-2. Javelin: 1. Samantha Thompson, H, 101-6; 2. Alex Snyder, H, 96-4; 3. Gracie Grieco, H, 89-0. Long jump: 1. Sophia Gardner, L, 16-0; 2. Jayden Leighow, H, 15-1; 3. Charlotte Neylon, L, 14-5. Triple jump: 1. Jayden Leighow, H, 34-1; 2. Hannah Knecht, L, 30-11; 3. Kenna Ammar-Khodja, H, 30-1. High jump: 1. Jayden Leighow, H, 4-6; 2. Alex Snyder, H, 4-4; 3. Leah Peterman, H, 4-4. Pole vault: 1. Hailey Zurich, L, 11-0; 2. Allie Dowell, L, 7-6; 3. Janaya Post, H, 7-0. R. McCarty, N. Hopely (7) and J. Aira IV. Max Bair, Devon Sanders (8) and Brittan Kittle. W–Bair (4-2). L–McCarty (5-4). SV–Sanders (2). Top Penn State Abington hitters: R. McCarty 2-3, RBI; S. Stevenson, 2B. Top Penn College hitters: Colton Riley, 2B.